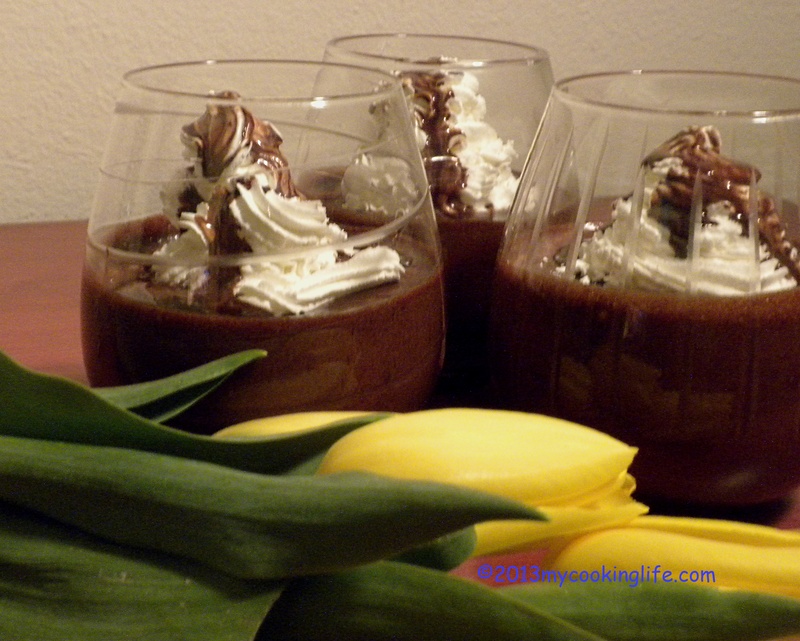 This month’s dark chocolate mousse experience took me and my husband by surprise, I must say! March’s Mousse is the most creamy, rich and yet light mousse yet. It was so rich and chocolatey that the three servings I made could have easily served six. You just don’t need a regular-sized serving of this dessert! My original idea for March’s entry in the dark chocolate mousse quest was to come up with a St. Patrick’s Day themed mousse. But the actual mousse making didn’t happen until later Sunday evening so let’s just say March’s mousse celebrates the Irish in all of us no matter what day it is. As you may remember from my original resolution to make one dark chocolate mousse a month in 2013, I am by no means an experienced mousse maker and until I made Miss January Dark Chocolate Mousse, I had never fiddled with melting bittersweet chocolate over a bain marie. We ended up with a very thick and luscious mousse based on the French standard recipe from Julia Child. February’s mousse was quite different (and far less sinful) using only bittersweet chocolate and whipped egg whites. That one was delicious too! I must say we couldn’t really detect the Guiness Stout at all but the dark chocolate sauce with Baily’s did retain a great deal of flavor and was to die for! We went all the way with this one and added real whipped cream to show off the sauce in the photo but you really don’t need it. This mousse looks so dark and rich yet it litterally disappears in your mouth on contact, leaving you with the sensation of deep, dark chocolate and creamy richness. For the basic recipe, I turned to the Guinness Storehouse website straight from Dublin. If you look at this website, you’ll see beer glasses filled with this mousse. Now that I’ve tried the mousse, I can’t imagine in my wildest dreams eating this much of the stuff in one serving. I do believe that would officially count as one of the thirty ways to experience death by chocolate! Again, this would actually make 6 servings. 2. Beat the egg yolks until they are lighter and thicker. Incorporate the Guinness with the disolved sugar and beat until it is ribbony. 3. In a separate, dry and very clean bowl (I like a stainless steel bowl) whisk the egg whites until they form soft peaks. Do not over-whip them. Kudos to my husband who did an excellent job of this! 4. Melt grated or broken bits of chocolate with the butter by putting a heat-proof bowl or small pan over another pan of simmering water. Do not let the simmering water touch the bottom of the pan with the chocolate. Stir, stir, stir until you have creamy, shiny melted chocolate. 5. When the chocolate is melted, let it cool slightly. Keep stirring to maintain smoothness. Then incorporate the chocolate into the yolk mixture starting with a little and then the rest of the chocolate. Mix this gently together. 6. Fold in your soft-peaked egg whites. Now you can put your mousse into whatever kind of dish or glass you want to serve it in and chill it. We chilled ours for only about a half hour and couldn’t wait any longer to taste it. For the chocolate sauce, I mixed about 1/4 cup of 100% pure cocoa powder into about a half cup of Baily’s Irish cream and stirred it over the hot water, just like the other chocolate. At first it looked kind of grainy and ucky, but then it smoothed out to a wonderful, very dark sauce. Continue to stir and let it heat and thicken. This also helps to cook off the alcohol in the Irish Creme. I made real whipped cream by whipping heavy cream with stevia and a dash of vanilla, but like I said—you don’t need it except for the fact it really looks nice. Serve the mousse with whipped cream and dark chocolate Irish creme sauce drizzled over the top. It’s chocolate heaven! You’ll believe you found the pot of gold at the end of the rainbow! This entry was posted in Chocolate, Mousse and tagged Baily's Irish Creme recipe, bain marie, bittersweet chocolate, dark chocolate mousse, Guinness Stout recipe, how to prepare chocolate by mycookinglifebypatty. Bookmark the permalink. I read this before, but apparently did not comment. I accidentally thought, at first, that it said “mouse” and that maybe Claude was posting… 🙂 The recipe, by the way, looks delicious! It was almost too delicious, Kathy. Funny how I’ve got my mousses and meeces, huh? Thank you Janine! It wasn’t difficult to make either.